Europe has a long history of employing tidal forces to generate power, and tide mills dating back to the Middle Ages can be found across the continent. A dam with a sluice was constructed spanning a tidal inlet, or a section of a tidal estuary was turned into a reservoir. At high tide sea water flowed into the resevoir through a one way gate. The gate closed automatically when the tide began to fall and when the tide was low enough, the stored water was released to turn a water wheel. 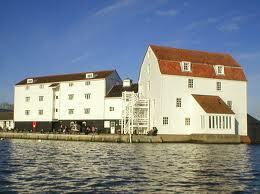 Woodbridge Tide Mill, dating from 1170, in Suffolk, England, is an excellent example. Another good site is the Rance estuary in France. These tidal mills are the precursors of modern tidal barrages.